No Obligation TopGolf Franchise Startup Quotes From Companies Near You for Free! On average a TopGolf franchise costs up to $18 million dollars to build, however start up costs will fluctuate. One facility in Austin, TX was built for around $15 million while a new TopGolf that was built in Las Vegas cost over $50 million! If you are considering opening up a TopGolf franchise; congratulations! This innovative business endeavor is full of friendly competition, unique entertainment and charismatic team members. A dynamic venue that offers exceptional entertainment value for the entire family, delicious menu selections and promises tons of fun for guests and employees. 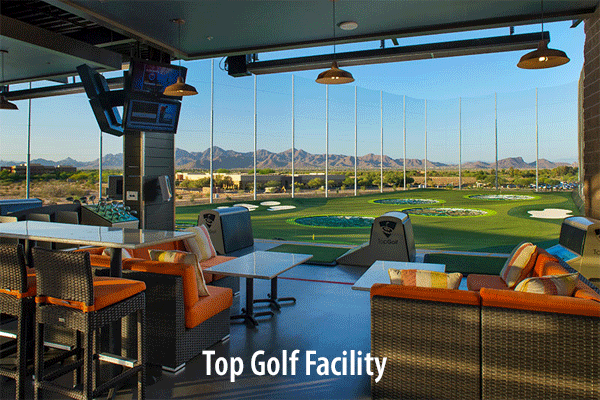 TopGolf locations have revolutionized the sport by taking the serious level down a notch. Being good at golf is not a requirement to have fun and enjoy a lively atmosphere. Tasty appetizers, refreshing drinks and some fun music provide a delightful atmosphere while you practice your swing and perfect your game. Continuous food and drink service by servers known as "caddies" enables you to stay focused and get in the zone. Imagine hitting your golf ball and instantly reading the stats on your shot. The genius behind TopGolf relies on using special golf balls outfitted with micro-chips. Players then utilize real clubs (free to rent for the entire family) and take shots onto an outfield. Highly addicting and entertaining, players of all capacity will enjoy the positive atmosphere and feedback on every shot. Targets range from 215 yards to 20 yards; ideal for everyone. Players never have to worry about keeping track of their previous scores as their membership card holds all the answers. Purchase your games onto your card and use at any TopGolf location. Note that once game credits are loaded onto the card, they are unable to be refunded. The average TopGolf facility is 65,000 square feet and three storeys high. Over 1250 people can simultaneously have fun and relax. This destination point features monthly membership fees or one time drop in opportunities. There are special discounts for Junior Members available. Due to the state-of-the-art equipment, exuberant real estate and spectacular facilities, these locations are popping up with excellent revenue reports and decent expansion. along with a host of other golf related items. The average TopGolf facility costs approximately 18 million dollars to establish. Originating in the UK and now with numerous locations over the USA; the company plans to expand globally. At this time, the official website is stating that TopGolf is a privately owned company with no current franchise opportunities; however, if you do have 10 to 20 million lying around, you may wish to pursue this endeavor. TopGolf locations offer year round entertainment. Never experience numb hands, disruptive wind or rain or not being able to see your ball due to the sunshine. Enjoy your membership on a daily basis and swing by after work or school. Plan your next corporate event, birthday party or team building exercise in a facility that offers exceptional service and memorable fun. Many people want to swing their clubs yet feel discouraged at a regular driving range. Waiting for your tee time or having experienced golfers line up behind you can be intimidating. Thankfully, TopGolf offers a roof top terrace complete with fire pits and an exquisite lounging facility to help you pass the time. An official dress code is not required. Socializing and fun is the mainstay along with perfecting your game of course. If you have ever wondered how close your ball made it to the target or how far you actually hit it; fear not. Every golfer has had those very questions and it was this lack of data that created the TopGolf concept in the first place. With over 90% of patrons revisiting a second time, TopGolf has captured the fun and strategy of the game and made it accessible to everyone. Grow your skills while you grow your bank account. Maybe one day you can open up your very own TopGolf franchise! In the mean time, enjoy your membership and visit as many locations as you can.